Since its accession to the Madrid Protocol in 2015, the African Intellectual Property Organization (OAPI) is available in the list of targetable territories in the context of an international application. As a preliminary, it must be admitted logically, and without considering the figures, that the rallying of OAPI seems to be a boon for international depositors, because to designate OAPI is also to target a market composed of 17 states. Africans (Benin, Burkina Faso, Cameroon, Central African Republic, Chad, Comoros Islands, Congo, Equatorial Guinea, Gabon, Guinea, Guinea-Bissau, Côte d’Ivoire, Mali, Mauritania, Niger, Senegal and Togo). However, this a priori good idea seems to raise many legal questions on which the criticism is based. To this end, OAPI has made transitional arrangements to anticipate possible contradictions with the current Bangui Agreements, pending the coming into force of the new Bangui Agreements. A small assessment after three years of practice will certainly raise the interest of the ratification of the OAPI to the protocol of Madrid, but also to apprehend its effectiveness. It must be said that while ratification of the Madrid Protocol has been one of OAPI’s main innovations in recent years to make the Office more attractive, this initiative is still used as an “alternative” for applicants. One of the reasons certainly lies in the legal uncertainty inherent in the contradiction of the Agreements governing OAPI on one hand and WIPO on the other. But another reason may also be simply a consequence of the underlying evil in African intellectual property law: the effective protection of rights. First, the fragility of the international filing is due to a rather vague incorporation in the Bangui Agreements thus does not reassure applicants who still rightly prefer the direct filing to the office. This uncertainty of the implementation of the rights and the effectiveness of OAPI’s enforcement of an international trademark certificate is not overcome even by the international reputation of the Swiss institution. It should also be noted that while it is possible to carry out filing procedures designating OAPI remotely through WIPO’s online platform, it is still essential to be represented by an agent locally to act directly to the Office on a series of issues (opposition for example, various notifications …). 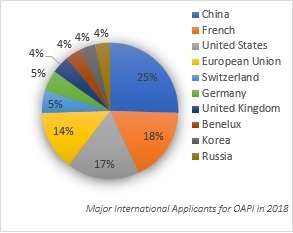 Indeed, OAPI does not yet have an online platform allowing the applicant to interact directly with the examiners – who in addition seem to favor correspondence in French and to a lesser extent in English even if they are the two official languages . Secondly, the protection of rights in Africa, including OAPI, is still to be promoted and valued by administrative and judicial bodies. It is clearly still difficult to defend effectively against usurpation of rights, unfair competition and counterfeiting of goods. With the accession to the Madrid system, OAPI must continue this dynamic of intellectual property awareness and continue to train quality experts. 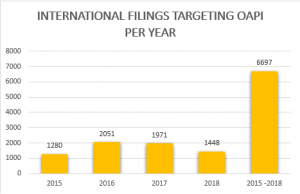 It must also be noted with great certainty that since its ratification to the Madrid Protocol, OAPI has been steadily improving the treatment of international filing procedures even though the growing number of direct OAPI deposits or those via WIPO requires a pace of treatment which remains difficult given the Organization’s staff, which continues to grow. The international filing will certainly become more attractive through faster processing of applications, more effective protection with harmonized rights and objectively identical treatment (whether with an OAPI or WIPO certificate), and legal measures in terms of implementation of border rights and control such as those foreseen in the new Bangui Accords, which will enter into force soon. Some countries show a greater interest in Africa, like China, which has a clear lead with more than 20% of international applications designating OAPI in 2018. This shows once again that Africa remains one of the first markets of the future still open to B2C or B2B competition. It should also be noted that many well-known brands had not yet been registered in the 17 Member States. This is a real race to hold leadership in this promising market. The biggest surprise of this ranking is Switzerland is rank same as Germany. This is a concrete example of a country for which the Madrid system has favored opening to the African market. Surprisingly, the United States, the world superpower seems less active compared to the dynamism of its economy but remains on the same level as France. Finally, the European Union is not left out. This shows that applicants from EU Member States keep an eye on this region.